Please enjoy this clip that is intended as a playful trailer for my dissertation. 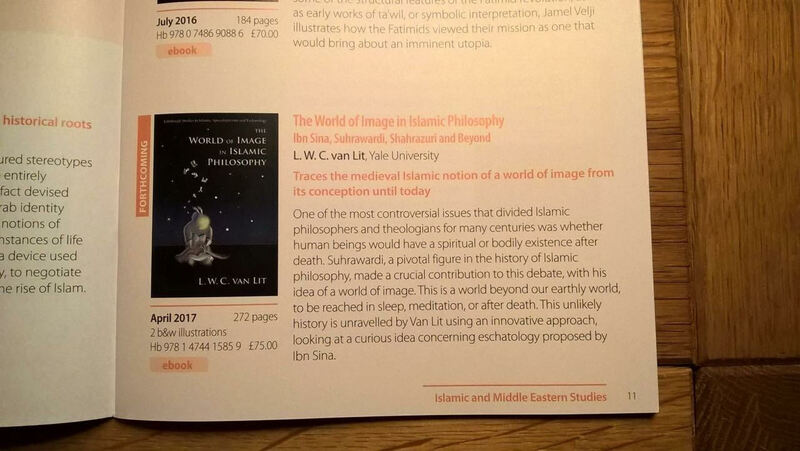 The World of Image in Islamic Philosophy: Ibn Sīnā, Suhrawardī, Shahrazūrī, and Beyond is my book that is published with Edinburgh University Press, April 2017. It is based on my doctoral dissertation. Visit http://www.zazzle.com/almaqtul/products for some awesome merch. The most significant result of this study is the rehabilitation of Shahrazūrī as the ultimate architect of the philosophical expression of the notion of a world of image (ʿālam al-mithāl). Suhrawardī did not provide a well-formed account of a world of image (ʿālam al-mithāl), in fact, he did not even use this term. Instead, it appears that the development of the idea knows three major stages, connected to the thinkers who brought the idea to a new level: Ibn Sīnā (d. 1037), Suhrawardī (d. 1191), and Shahrazūrī (d. ≥1288). It is only the latter who coined the well-known technical term ‘world of image’ and definitively turned the ideas of his predecessors into the formulation and philosophical defense of an ontologically real and independent, magnitudinous world, a world in which things can have all the characteristics that material things have, while at the same time remaining immaterial. Another important part of my dissertation is a detailed study of the reception of Shahrazūrī’s idea. In light of this study, I show how this most peculiar idea that became the subject of much criticism, was nevertheless able to conquer a place in mainstream, traditional Shīʿī thought. It further became clear in this study that intellectuals who directly commented upon Suhrawardī’s works show only a lukewarm appreciation of the idea. This puts in doubt whether these commentators were ardent adherents of Suhrawardī’s philosophy. Lastly, I developed a methodology that may be of use for other parts of Islamic intellectual history. A focus on author’s intentions does not seem to work well for Islamic intellectual history, as the practices of preservation and appropriation are so widespread, that it is no guarantee that if a certain idea is present in a certain text, then the author of that text adheres to that idea. Preservation is the practice of preserving knowledge from falling into obscurity. In a manuscript culture, manuscripts inevitably suffer from a loss rate and the total population of manuscripts is, for most ideas, relatively small. Therefore one has to keep copying the words that are the carrier of a certain idea for that idea to survive. Appropriation is similar to preservation, though it is more subtle. Whereas preservation sometimes goes with a reference to the original author, appropriation rarely does so. It is called appropriation because usually small, though sometimes large, changes are made to the original text that do not necessarily alter the meaning, but do change its wording. Appropriation reveals a practice of studying and reflection on the source text, since only someone who understands the idea that is expressed by the text, can alter that text without mistakingly changing its meaning. One key notion I developed is that of the ‘restricted commentary tradition’. A restricted commentary tradition is a set of texts that were meant to be circulated, that are commentaries on either one source text or all texts of one person, including all those that are source texts themselves. As such they form the backbone of a text’s reception. The World of Image in Islamic Philosophy: Ibn Sīnā, Suhrawardī, Shahrazūrī, and Beyond, Edinburg: Edinburgh University Press, 2017. Along with the defense of my dissertation I organized a small symposium. Click here for more information. 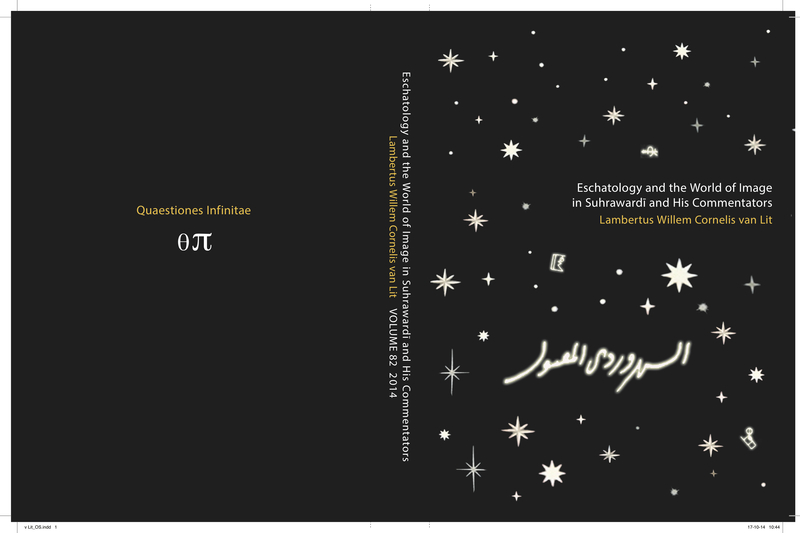 I wrote an article: “Ghiyāth al-Dīn Dashtakī on the world of image (ʿālam al-mithāl): The place of his Ishrāq Hayākil al-nūr in the commentary tradition on Suhrawardī”, Ishrâq: Islamic philosophy yearbook, no. 4, Moscow: Vostochnaya Literatura Publishers, pp. 116-136. See also (forthcoming) “Translation of “The Epistle on the Establishment of the Imaginable, Apparitional World” by Shahrazūrī”, Memorial volume for the late Hossein Ziai, ed. J. Walbridge. See also (forthcoming) “The Commentary Tradition on Suhrawardī,” Philosophy East and West, 68:1, 2018. See also “Secret Symbols from an Islamic Philosopher,” Islamic World of Art, vol. 4, 2016. See also (forthcoming) “Suhrawardī, Ibn ʿArabī, and the World of Image: One term different meanings,” Journal of the Muhyiddin Ibn ʿArabī Society. Second Place as part of the Young Writer Award 2016 competition.